This is a ‘what-if’ series where I apply my spin on actual products available from Thinkgeek. Ah, Thinkgeek. Home to many cool and creative products. Every so often I will browse their wares and see what cool toys they have for discriminating geeks like myself. Once in awhile I’ll see something they’re selling and think, hey wouldn’t it be cool if…? Well I thought I’d share some of my musings, because that’s what I do. First up we have the ‘Electronic Firefly in a Jar‘, which is a neat simulation of a real firefly trapped in a jar (video at the link). The fake firefly ‘flies’ around (it’s tethered to the lid), emits light, and sometimes parks itself on the side of the jar, where it reacts to your tapping. It flaps its wings too. Cool beans. I’d just swap out the firefly for Zelda’s Navi, the true antagonist of Ocarina of Time (Ganondorf had nothing on her). The hapless Navi would still fly around and emit light, in addition I would also add a sound chip to the inside of the lid, allowing Navi to emit her famous phrases. And this would be brilliant because most sound chips have poor-sounding quality, but inside the jar it would sound muffled and mostly inaudible*. If I had one of these on my desk, I would wring my hands and laugh maniacally every time I heard the faintest protest coming from Navi. It would be glorious. There would need to be a switch where the frequency of her voice phrases could be determined (once every half hour would be ideal). I’d also add an on-demand button on the lid to trigger a line of dialogue too. I’d try to make the jar look Zelda-ish too (above example was a stock photo). I think this would make for a nice ambient lamp as well. If you like this product idea, I suggest you bug Thinkgeek about it. Get it? Bug? *I suppose if you wanted to hear her you could crack the lid open a bit. WANT. SHUT UP AND TAKE MY MONEY! I think every Zelda fan would want this. 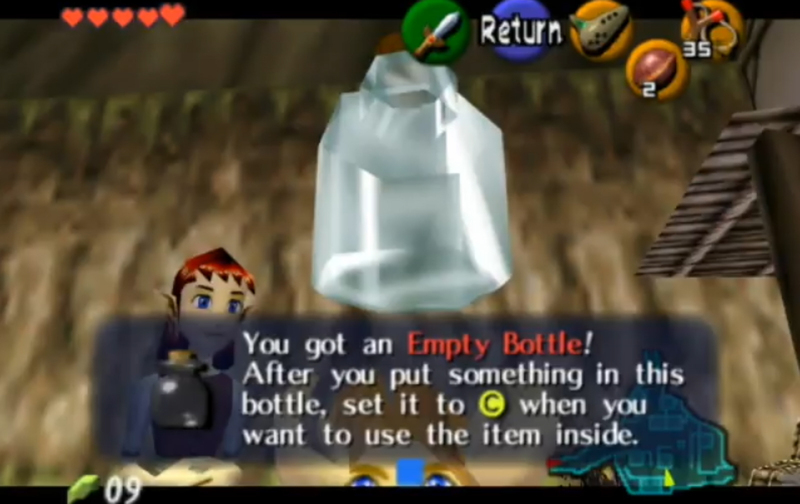 There is also bottles with large cow labels but you couldn’t see Navi all that well. A Zelda pattern all over the glass (like the Thinkgeek version) would look awesome too. A few people had a similar idea in the comments section for the product itself (Navi/Fireflies from Ocarina), but it’s still an awesome idea. It’s $20 plus shipping, so as long as the price stays south of $30 with a NIntendo license I would buy a Navi in a jar in a heartbeat (needs voice tho, that’s a must have). Whoops didn’t see that. Glad to see other people have arrived at the same conclusion! Wonder if it would be difficult to make a homebrew version? Cut a ping pong ball in half and cover the firefly and add bigger wings? Jeez…I’m going to end up commenting on all your posts. I agree with you. Thinkgeek is awesome. Thank you for sharing these stuffs because I think I have missed or overlooked them there. I really love doing art out of renewable materials. i be more then happy to R&D this for ya’ll. i made a high pluseing uv led, with a solar engine. i used a clear coat of uv paint inside the jar. and made Tael form Majora’s Mask.